“We were excited when Ram announced his candidacy for the state senate last fall. Instead of continuing to advocate for our members and work to protect vital programs such as home healthcare, child care and other vital services, Ram recognized the opportunity to get involved and serve his district by running for office himself. Working families across Illinois, and certainly his would be constituents, will benefit immensely by having Ram as a leader in the Senate fighting for progressive solutions. 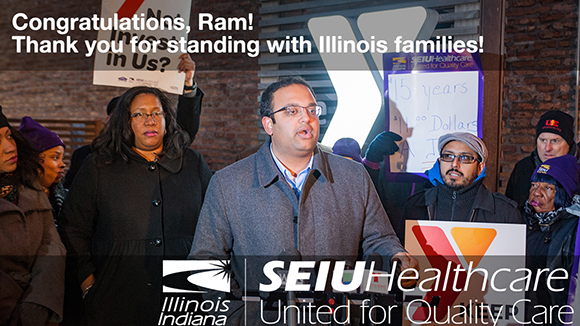 “Ram ran a tough, disciplined and inclusive race that earned him important endorsements from members of Congress such as Brad Schneider, Jan Schakowsky, and Mike Quigley, as well as major endorsements from the Chicago Sun-Times and Chicago Tribune. They all recognized Ram’s leadership abilities, intelligence, hard work ethic, and in-depth knowledge of the issues. “Ram Villivalam’s victory is a testament to the power of grassroots organizing and campaigning. With respect to the #MeToo movement, Ram rightly said “women need to be believed. And men need to be held accountable.” Ram is a strong supporter for solutions to preventing gun violence. He is a forceful advocate to defend a women’s right to choose, protect the environment, and provide access to quality and affordable healthcare – issues that earned him strong support and endorsements from Planned Parenthood of Illinois, Sierra Club, and SEIU’s State Council. “As an advocate for our own SEIU members, Ram was a key leader fighting to raise the minimum wage to $15 an hour and to stop Gov. 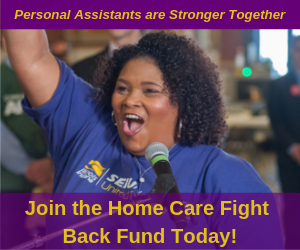 Rauner’s extreme agenda to slash vital services. The list of issues and fights that Ram contributed to on behalf of our members are simply too many to count. “We have faith in the voters that Ram will win his election in November. And when he finally takes the oath of office, working families in Illinois, especially his constituents in the 8th district, will benefit immensely from his ideas, passion, and dedication to finding solutions to solving Illinois’ biggest challenges such as income inequality and demanding fairness for workers.